Few things compare to summers in Minnesota. Backyard barbecues are fired up, cabins are aired out for weekend getaways, and people turn out in droves to enjoy the state’s 10,000+ lakes. Many dogs enjoy Minnesota summer fun as much as their humans, and what’s not to love? So many of the activities people enjoy, dogs do too – like socializing, long walks, games of catch, trips to the park, and swimming! 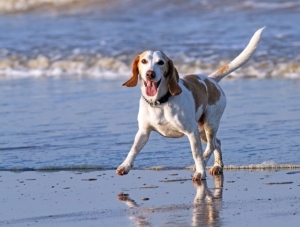 But, before you head out with your pup, take a look at these simple tips to ensure that summer fun will be had by all. Avoid Bug Spray. Unless a product is made for pets like these for tick prevention, do not put it on your dog. Even products labeled “natural” should be avoided. Citronella, for example, is an irritating toxin to pets and can cause severe respiratory illnesses and harm the nervous system if ingested. Check That I.D. Be sure your dog is wearing identification and that it is current. This simple step will increase the chances of being reunited in the off chance you are separated. Flame Off. Not only is it important to pay close attention to your dog when they are near fires or flames of any size, but lighter fluid and matches can also be harmful if ingested, cause irritation on contact, and respiratory problems if inhaled. Protect your dog by keeping these hazards out of reach. No Sharing! Barbecues can be a veritable smorgasbord for dogs. Unfortunately, some human favorites can be potential hazards to your pets. Play it safe and stick to sharing dog treats with your best-friend. Pass on Fireworks. Firing up the sparklers and bottle rockets or bringing your dog to a fireworks display can be tempting, but the noises and crowds can be frightening for animals as well as potentially dangerous. If fireworks are on the agenda, it’s safest to leave your pooch at home. Safer Swimming. Various types of algae are common in Minnesota lakes but make sure you’re familiar with conditions that can cause blue-green algae. Blue-green algae can be potentially dangerous and cause illness in both humans and dogs. Say No to Glow. Putting glow in the dark jewelry on your dog may seem like a cute idea, but they are easy for dogs to chew. If ingested or swallowed, they can cause gastrointestinal irritation as well as intestinal blockage. Stay Cool. Help your pup beat the heat when the temps run high with these tips, or whip up a tasty frozen treat to up the cool factor! No matter how much fun you think an activity may be for your dog, sometimes they can’t join you. Learn more about our Playday and Overnight boarding options. With two locations, it’s easier than ever to make sure your dog is having just as much fun this summer as you are.